We love using Chromebits to display dashboards on TVs. Having your metrics up on a screen will make a huge difference in the insights you get out of your data. Here are the instructions on how to install a Chromebit and get your dashboards displaying on the wall. First, plug the Chromebit device into the the TV HDMI port (remember which port it is), then plug the other end into an outlet. From inside the mini keyboard, remove the USB from the side and plug it in to the USB port on the Chromebit. Power up the keyboard by pressing one of the two "click" buttons. Then turn on the TV and select the input port which the Chromebit is plugged into. You'll then want to sign in to the Chromebit with your Google Credentials. Go into the Chromebit settings and select Power under the Device category. Inside the Power setting select the option "Keep display on". Go ahead and open Google Chrome. 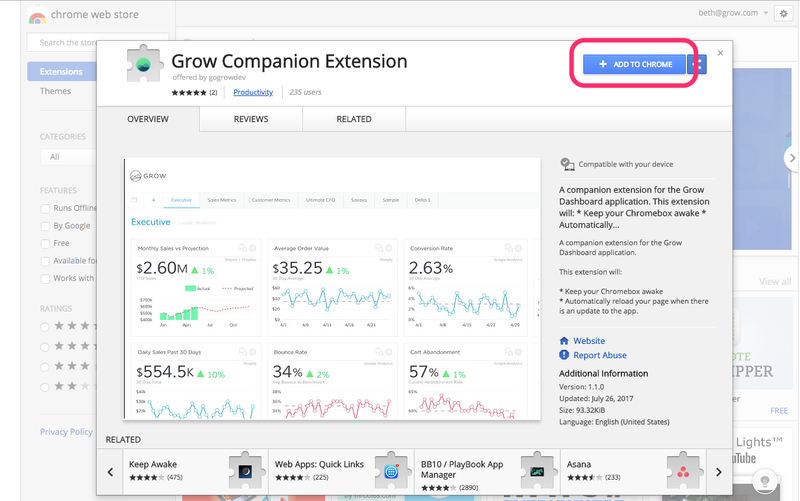 Search for "Grow Companion Extension" and click the link for the Chrome Web Store. You can also use this link. In the Chrome Web Store, click the "Add to Chrome" button to add it to your Chromebit. After you've done all that, go to Grow's login page and sign in to your account. Go to dashboard you want to display on the TV, then click the Full Screen Mode icon in the upper right-hand corner. Click the Chrome prompt Allow full screen. You can then toggle between the white background or night mode. 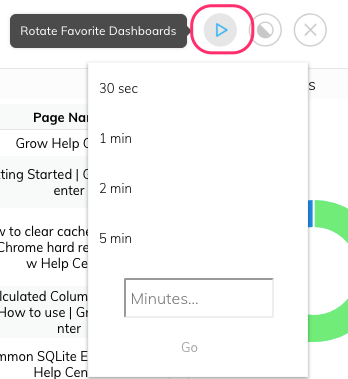 This setting will allow you to rotate through your favorite dashboards. In order to do this, go to the dashboard manager on the left and star the ones you want in your rotation. 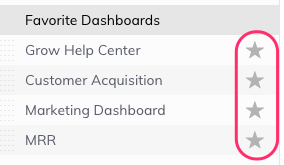 Starred dashboards will appear at the top in your Favorite Dashboards list. Only the ones you have starred will show in the rotation. You can then enter full screen mode. Once in full screen, click the Play icon in the upper right-hand corner to rotate the dashboards. You will need to specify the time interval between transitions. If you enter a custom interval, be sure to press Go when you are done. Pro tip: Use the zoom button (shift/command and +/-) to adjust the tiles on your dashboards to fit your screen size. Select the Grow Companion Extension Logo on the extension bar in your browser. 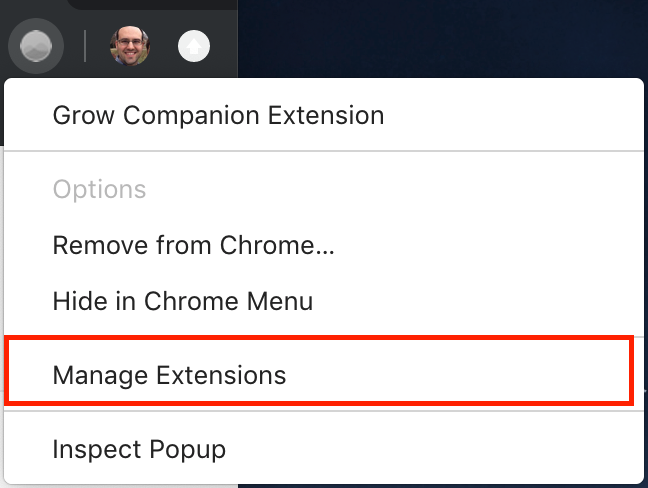 Select Manage Extensions in the menu. 3. Select the Update button at the top of the page. 4. You will likely have to log out of Grow and log back in for the changes to take effect. Sign in to the Chromebit with your Google Credentials. Inside the Power setting, select the option to "Keep display on." Again, you may have to log out of Grow and log back in for the changes to take effect.